We love seeing hard-core firmware reverse engineering projects, but the number of hackers who can pull those off is relatively small. It’s possible to grow the ranks of the hacker elite though. A hackerspace is a great place to have a little challenge like this one. [Nicolas Oberli] put together a capture the flag game that requires the contestants to reverse engineer Teensy 3.0 firmware. He developed this piece of hardware for the Insomni’hack 2013 event. It uses the Teensy 3.0 capacitive touch capabilities to form a nine-digit keypad with a character LCD screen for feedback. When the correct code is entered the screen will display instructions on how to retrieve the ‘flag’. To the right you can see the disassembly of the .elf file generated by the Arduino IDE. 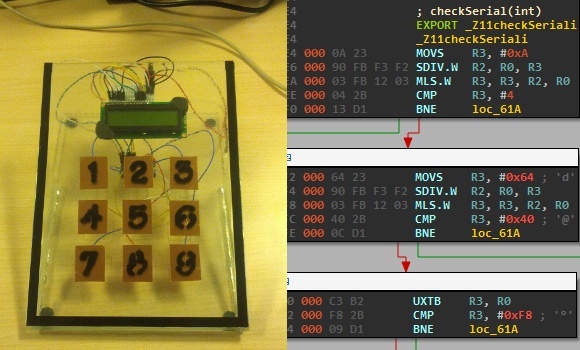 This is what [Nicolas] gave to the contestants, which gets them past the barrier of figuring out how to dump the code from the chip itself. But it does get them thinking in assembly and eventually leads to figuring out what the secret code is for the device. This may be just enough of a shove in the right direction that one needs to get elbow deep into picking apart embedded hardware as a hobby. [Cyber Explorer] recently ditched his collection of physical computers acting as servers by virtualizing the lot of them. But with every change there’s a drawback. Although it wasn’t too hard for him to set up the virtual machines, he did end up spending quite a bit of time trying to improve the bandwidth. Luckily he posted an article chronicling all of the VM tweaks he used to improve the system. The experience involves both a Windows 8 machine, as well as a some Linux boxes meaning there’s something here for everybody. At each step in the process he performs some throughput tests to see how the boxes are performing. Tweaks are numerous, but include trying out different Ethernet drivers, making sure all modules are up to date, squashing at least one bug, and giving jumbo-frames a try. Honestly, after breaking it down in such a manner, making the top 10 movie hacking failures, felt painfully general. It is like making a list of “top 10 animals that ever existed”. The state of technology portrayal in movies is frankly abysmal. It is obvious that the only people who know less about tech than “hollywood” are the people making laws about it. [Dillon] wrote in to tell us about his latest project, an automatic light switch for a the hallway closet in his house. Although this project could probably be done very simply, [Dillon] accomplished everything in a way that actually looks professionally done and has some neat features. Check out his site for more pictures of the build. Not that we at [HAD] mind a bit of messy wiring, but if it’s going inside a house, neater is always better. On the other hand, this project took nearly a year to go from idea to implementation, so please keep submitting your spaghetti-wired projects. We understand. There are a lot of hacks out there for Ikea’s Dioder LED light set. [Lambertus] wanted to create an easy and affordable ambilight while keeping the hardware modifications to a minimum. He also wanted anyone to be able to easily duplicate his work. He recently wrote in to share his successful solution. The customizations boil down to three main steps: solder the ICSP connector wires to the test points on the Dioder PCB, connect a PIC programmer to the ICSP port (and reprogram), and attach a 5V RS-232 device to the ICSP port. The software was the most difficult part of the procedure for [Lambertus]. The PIC16F684 didn’t contain the required UART and PWM controllers, so he had to get crafty. Fortunately he’s done all the work for us, and lists the necessary .hex file he created on his site. By adding support to boblight, his new ambilight is working with his media center very nicely. There’s a little demo video after the break. Most microcontroller manufacturers give you some kind of free development toolchain or IDE with their silicon products. Often it’s crippled, closed source, and a large download. This is pretty inconvenient when you want to have firmware that’s easy to build and distribute. I’ve found many of these toolchains to be annoying to use, and requiring closed source software to build open source firmware seems less than desirable. It’s possible to build code for most microcontrollers using command line tools. You’ll need a compiler, the device manufacturer’s libraries and header files, and some method of flashing the device. A lot of these tools are open source, which lets you have an open source toolchain that builds your project. Setting up these tools can be a bit tricky, so I’m building a set of templates to make it easier. Each template has instructions on setting up the toolchain, a Makefile to build the firmware, and sample code to get up and running quickly. It’s all public domain, so you can use it for whatever you’d like. Currently there’s support for AVR, MSP430, Stellaris ARM, and STM32L1. More devices are in the works, and suggestions are welcome. Hopefully this helps people get started building firmware that’s easy to build and distribute with projects.